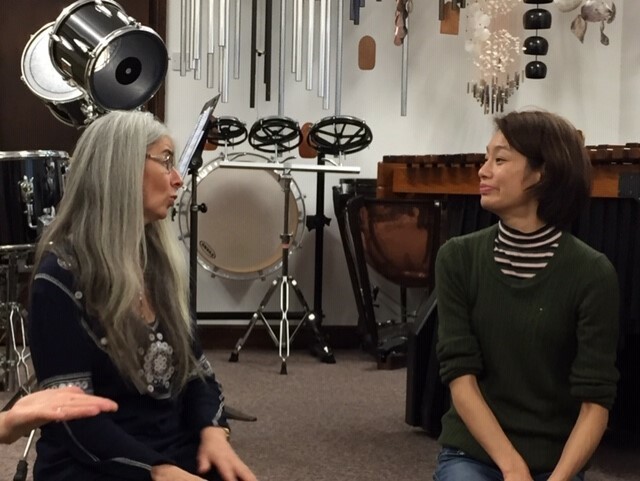 When Audiovisability mentioned that we were going to work with Evelyn Glennie, I was excited. It is a HUGE honour and privilege to be asked to write this blog. I remember Evelyn Glennie when she performed at my school in the 1990s and I was enthralled watching her! In year 10, I even stayed in a dormitory named “Evelyn Glennie”. I am an equestrienne, more specifically, a dressage rider. So, you may ask, how does it involve music? One of the tests in dressage is the Freestyle, which is not dissimilar to Torvil & Dean doing their freestyle to Bolero, except instead of ice skates, I am “dancing” with my horse. As part of the Audiovisability dressage project, Evelyn was asked to play the main component of my freestyle music, specifically composed for my freestyle performance with Sherlock at the World Equestrian Games 2018 in Tryon, USA. I FEEL… Feel the rhythm, feel the music. Some horses are musical but some are not. A horse with good rhythm in paces helps but it is not enough. Neither is knowing when to start and finish (due to my deafness, I am allowed someone to indicate the beginning and end of the music). To perform to any piece of music, one also needs to know what the music sounds like (e.g. what instruments are used), how it is layered, when and how it changes etc. I have learnt that these are a few simple things that my hearing peers have access to, which I do not. When on top of my four-legged partner(s), I do not receive the same vibrations as when sitting in my study focusing on ”listening” to the music. It seems like the sound waves and vibrations travelling through the dressage arena seem to disperse and disappear into thin air. I feel music is “invisible” as there is nothing to indicate the music to me… except perhaps the occasional twitch from my horse’s ears. I imagine having live music playing next to the arena would make music more “visable” and although I may not be able to look at the musicians throughout my freestyle performance, I can glance over and / or see their body language out of the corner of my eyes. Someone like Evelyn Glennie, who is very expressive and animated, is a perfect example for me. Arriving at Evelyn’s studio, I felt out of my comfort zone, like a fish out of water. I have no background in music and yet I needed to work with music to perform my freestyle. Evelyn was very warm and welcoming, and quickly put me at ease. Evelyn showed me a handful of the different instruments in the studio, the vibraphone, the metallophone, the marimba, the waterphone etc. When Evelyn asked me to lie down under the marimba while she played, I could feel the vibrations through my whole body (head to toe). It felt weird. With Evelyn’s guidance, I realised that vibrations can feel very different in different sitting or lying positions, and I felt most comfortable with the vibrations sitting up in a seiza position or crossed legged on the floor. Compared to perhaps a side sitting position, I felt more in balance, my back straight and vibrations were through my seat, like my position when I’m riding on a horse. I can feel the vibrations of music but perhaps I cannot ‘interpret’ it in the same way Evelyn or Ruth Montgomery, from Audiovisability, can. They are attuned to music; in the same way, I am attuned to the horses I train and compete with. My feeling through my seat is sensitive because a lot of ‘conversation’ with my horse is through there. 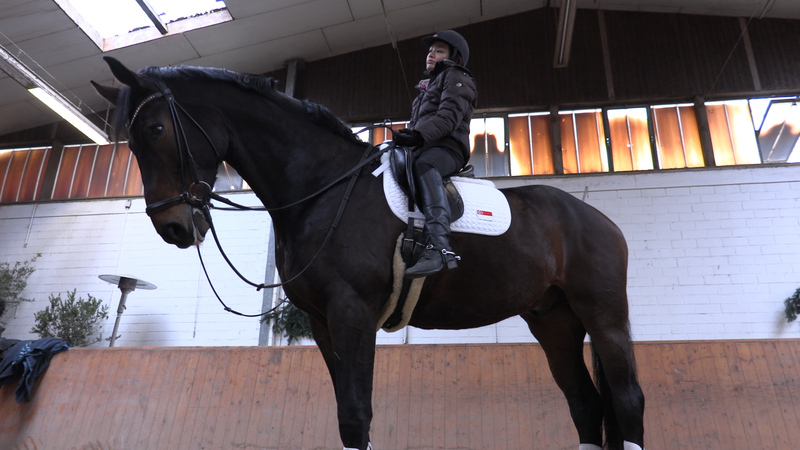 To halt a horse is actually through your seat, and a good, ‘square halt’ is an easy way to boost your marks in dressage competition. I can feel when my horse does a perfect straight square halt under me and when to give a ‘correction’ if one leg is out of place. Evelyn says she can play my freestyle music using 2 mallets (one in each hand) or a set of 4 mallets (two in each hand). In demonstrating with 2 mallets, it looks rather like it’s all in double-quick time. With 4 mallets, it looks much more like the pace of my horse, and as Evelyn points out, it represents my horse’s four hooves. I loved that analogy! To an untrained eye the mallets look the same but Evelyn allowed us to touch them, they actually differ in sizes, in length and weight. The thickness, the tightness or looseness (softness) of the yarn wrapped around the head, and whether it is a rubber or wooden head, all these factors affect the sound it brings out of the marimba. When Evelyn travels for music concerts and uses a different marimba, bringing her own set of mallets is important to her. Using her own mallets, Evelyn knows which ones to use to bring out the sounds (and vibrations) she wants. It is not just the type of mallets (instruments), it is how one expresses themselves, the dynamics, the size and furnishings of the venue that will affect the acoustics. In the same way, I can ride different horses but I must have my own customised looped reins. My reins are important, partly because they are customised to the way I hold them, but also because the ‘contact’ is the connection between my hands to the horse’s mouth. In dressage, using a combination of aids from the seat, legs and contact, the rider encourages the horse to go forward into the contact. There are also different types of “bit” that a horse may use, whether it is a snaffle (one bit) or a double bridle (double bit) that determine which reins I use. The contact between the rider’s hands and the horse’s mouth is like a telephone line, where the ‘conversation’ (i.e. touch) or ‘cord’ (i.e. reins) has to be soft, steady and ‘elastic’. Hence, the contact will differ on different horses for a rider to bring out the best performance in a horse. I know musicians who say that, for them, reading music is like reading a book, where when reading the music scoresheets, they can play or “see” the music before they actually play the notes. It is like, when reading a book, can you picture or “see” the scenes in your mind? Or perhaps, it is as though a film is playing in our heads while actually, we are reading a book? Evelyn made me realise that music can be experienced with emotions, shapes or colours, something I was not aware of. I learnt what notes can feel “cold” through vibrations, and which ones are associated with a “warm, earthy” feeling, something I never did before. After 2 days’ collaboration, I left Evelyn’s studio with an analogical “vision” of my freestyle music! Evelyn and I found there are many parallels in our work: musicians have a “bond” and work with their instruments; like riders with their horses. In equestrian, it is not just about the horse, nor about the rider, but the combination of horse and rider… the whole picture. Here is another “parallel”, there is now a “Laurentia Tan” dormitory in my alma mater! 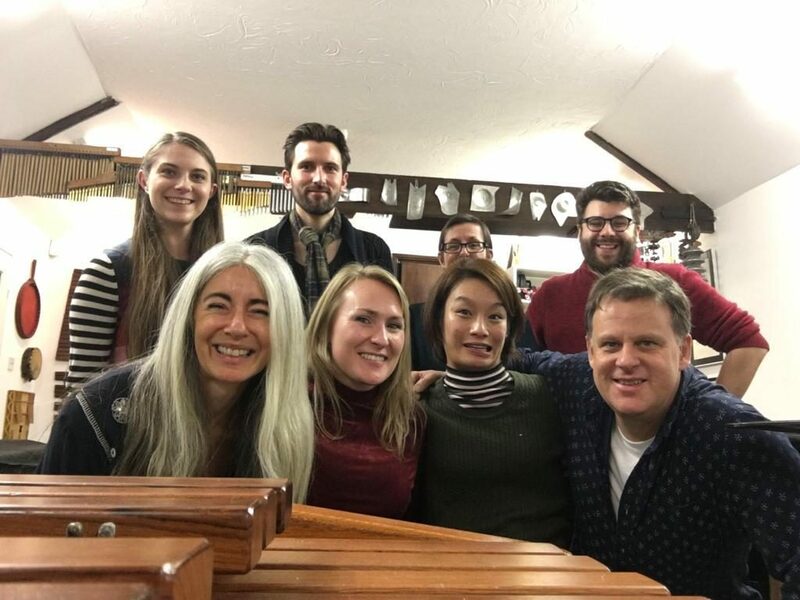 Generously funded by Arts Council England and The Sobell Foundation, supported by Deaf Explorer, (Alan McLean and Rachel Veazey) Decibels UK, Evelyn Glennie HQ and Eubel Volker at Dressurstall, Lerchenhof.